The theory of fixed interest bond pricing is an application of the theory of Net Present Value (NPV). Also, a 'fairly priced' asset is not over- or under-priced. Buying or selling a fairly priced asset has an NPV of zero. (a) The internal rate of return (IRR) of buying a fairly priced bond is equal to the bond's yield. (b) The Present Value of a fairly priced bond's coupons and face value is equal to its price. (c) If a fairly priced bond's required return rises, its price will fall. (d) Fairly priced premium bonds' yields are less than their coupon rates, prices are more than their face values, and the NPV of buying them is therefore positive. (e) The NPV of buying a fairly priced bond is zero. (a) The internal rate of return (IRR) of buying a bond is equal to the bond's yield. (c) If the required return of a bond falls, its price will fall. (d) Fairly priced discount bonds' yield is more than the coupon rate, price is less than face value, and the NPV of buying them is zero. A company selling charting and technical analysis software claims that independent academic studies have shown that its software makes significantly positive abnormal returns. Assuming the claim is true, which statement(s) are correct? (I) Weak form market efficiency is broken. (II) Semi-strong form market efficiency is broken. (III) Strong form market efficiency is broken. (IV) The asset pricing model used to measure the abnormal returns (such as the CAPM) had mis-specification error so the returns may not be abnormal but rather fair for the level of risk. (a) Only III is true. (b) Only II and III are true. (c) Only I, II and III are true. (d) Only IV is true. (e) Either I, II and III are true, or IV is true, or they are all true. Your friend claims that by reading 'The Economist' magazine's economic news articles, she can identify shares that will have positive abnormal expected returns over the next 2 years. Assuming that her claim is true, which statement(s) are correct? (iv) The asset pricing model used to measure the abnormal returns (such as the CAPM) is either wrong (mis-specification error) or is measured using the wrong inputs (data errors) so the returns may not be abnormal but rather fair for the level of risk. (a) Only (iii) is true. (b) Only (ii) and (iii) are true. (c) Only (i), (ii) and (iii) are true. (d) Either (ii) and (iii) are true, or (iv) is true, or (ii), (iii) and (iv) are true. (e) Either (i), (ii) and (iii) are true, or (iv) is true, or all are true. The US government recently announced that subsidies for fresh milk producers will be gradually phased out over the next year. Newspapers say that there are expectations of a 40% increase in the spot price of fresh milk over the next year. Option prices on fresh milk trading on the Chicago Mercantile Exchange (CME) reflect expectations of this 40% increase in spot prices over the next year. Similarly to the rest of the market, you believe that prices will rise by 40% over the next year. What option trades are likely to be profitable, or to be more specific, result in a positive Net Present Value (NPV)? Only the spot price is expected to increase and there is no change in expected volatility or other variables that affect option prices. No taxes, transaction costs, information asymmetry, bid-ask spreads or other market frictions. (a) Buy one year call options on fresh milk. (b) Buy one year put options on fresh milk. (c) Sell one year call options on fresh milk. (d) All of the above option trades are likely to have a positive NPV. (e) None of the above option trades are likely to have a positive NPV. A very low-risk stock just paid its semi-annual dividend of $0.14, as it has for the last 5 years. You conservatively estimate that from now on the dividend will fall at a rate of 1% every 6 months. If the stock currently sells for $3 per share, what must be its required total return as an effective annual rate? If risk free government bonds are trading at a yield of 4% pa, given as an effective annual rate, would you consider buying or selling the stock? (a) 9.55%, so buy the stock since its required return is too high for its low risk. (b) 7.37%, so buy the stock since its required return is too high for its low risk. (c) 7.37%, so sell the stock since its required return is too high for its low risk. (d) 3.62%, so buy the stock since its required return is too low for its low risk. (e) 3.62%, so sell the stock since its required return is too low for its low risk. Select the most correct statement from the following. (a) Markets are weak-form efficient. (b) Markets are semi-strong-form efficient. (c) Past prices cannot be used to predict future prices. (d) Past returns can be used to predict future returns. (e) Stock prices reflect all publically available information. (a) Markets are weak and semi-strong form efficient but strong-form inefficient. (b) Markets are weak form efficient but semi-strong and strong-form inefficient. (c) Technical traders make positive excess returns. (d) Chartists make negative excess returns. (e) Insiders make negative excess returns. A man inherits $500,000 worth of shares. He believes that by learning the secrets of trading, keeping up with the financial news and doing complex trend analysis with charts that he can quit his job and become a self-employed day trader in the equities markets. He earns $60,000 pa in his current job, paid in a lump sum at the end of each year. He enjoys examining share price graphs and day trading just as much as he enjoys his current job. Stock markets are weak form and semi-strong form efficient. He has no inside information. He makes 1 trade every day and there are 250 trading days in the year. Trading costs are $20 per trade. His broker invoices him for the trading costs at the end of the year. The shares that he currently owns and the shares that he intends to trade have the same level of systematic risk as the market portfolio. The market portfolio's expected return is 10% pa.
Measure the net gain over the first year as an expected wealth increase at the end of the year. Economic statistics released this morning were a surprise: they show a strong chance of consumer price inflation (CPI) reaching 5% pa over the next 2 years. This is much higher than the previous forecast of 3% pa.
A vanilla fixed-coupon 2-year risk-free government bond was issued at par this morning, just before the economic news was released. Inflation remains at 5% over the next 2 years. Investors demand a constant real bond yield. The bond price falls by the (after-tax) value of the coupon the night before the ex-coupon date, as in real life. (a) Today the price would have increased significantly. Over the next 2 years, the bond price is expected to increase, measured on each ex-coupon date. (b) Today the price would have increased significantly. Over the next 2 years, the bond price is expected to be unchanged, measured on each ex-coupon date. (c) Today the price would have been unchanged. (d) Today the price would have decreased significantly. (e) Today the price would have decreased significantly. A managed fund charges fees based on the amount of money that you keep with them. The fee is 2% of the start-of-year amount, but it is paid at the end of every year. This fee is charged regardless of whether the fund makes gains or losses on your money. The fund offers to invest your money in shares which have an expected return of 10% pa before fees. You are thinking of investing $100,000 in the fund and keeping it there for 40 years when you plan to retire. The fund has no private information. Markets are weak and semi-strong form efficient. The fund's transaction costs are negligible. The cost and trouble of investing your money in shares by yourself, without the managed fund, is negligible. A residential real estate investor believes that house prices will grow at a rate of 5% pa and that rents will grow by 2% pa forever. Real estate is and always will be fairly priced and the capital asset pricing model (CAPM) is true. Ignore all costs such as taxes, agent fees, maintenance and so on. All rental income cash flow is paid out to the owner, so there is no re-investment and therefore no additions or improvements made to the property. The non-monetary benefits of owning real estate and renting remain constant. (a) The rental yield will fall and approach zero. (b) The total return will fall and approach the capital return (5% pa). (c) One or all of the following must fall: the systematic risk of real estate, the risk free rate or the market risk premium. (d) If the country's nominal wealth growth rate is 4% pa and the nominal real estate growth rate is 5% pa then real estate will approach 100% of the country's wealth over time. (e) If the country's nominal gross domestic production (GDP) growth rate is 4% pa and the nominal real estate rent growth rate is 2% pa then real estate rent will approach 100% of the country's GDP over time. A managed fund charges fees based on the amount of money that you keep with them. The fee is 2% of the end-of-year amount, paid at the end of every year. The fund invests its fees in the same companies as it invests your funds in, but with no fees. The below answer choices list your expected wealth in 40 years and then the fund's expected wealth in 40 years. A fairly priced unlevered firm plans to pay a dividend of $1 next year (t=1) which is expected to grow by 3% pa every year after that. The firm's required return on equity is 8% pa. The firm is thinking about reducing its future dividend payments by 10% so that it can use the extra cash to invest in more projects which are expected to return 8% pa, and have the same risk as the existing projects. Therefore, next year's dividend will be $0.90. What will be the stock's new annual capital return (proportional increase in price per year) if the change in payout policy goes ahead? Assume that payout policy is irrelevant to firm value and that all rates are effective annual rates. One year ago a pharmaceutical firm floated by selling its 1 million shares for $100 each. Its book and market values of equity were both $100m. Its debt totalled $50m. The required return on the firm's assets was 15%, equity 20% and debt 5% pa.
Earned net income of $29m. Discovered a valuable new drug that will lead to a massive 1,000 times increase in the firm's net income in 10 years after the research is commercialised. News of the discovery was publicly announced. The firm's systematic risk remains unchanged. Which of the following statements is NOT correct? All statements are about current figures, not figures one year ago. (a) The book value of equity would be larger than the market value of equity. (b) The book ROA from accounting would be larger than the required return on assets from finance. (c) The book ROE from accounting would be larger than the required return on equity from finance. (d) The book ROE would be larger than the book ROA. (e) The required return on equity would be larger than the required return on assets. Hint: Book return on assets (ROA) and book return on equity (ROE) are ratios that accountants like to use to measure a business's past performance. The required return on assets ##r_V## is a return that financiers like to use to estimate a business's future required performance which compensates them for the firm's assets' risks. If the business were to achieve realised historical returns equal to its required returns, then investment into the business's assets would have been a zero-NPV decision, which is neither good nor bad but fair. Similarly for equity and debt. A company advertises an investment costing $1,000 which they say is underpriced. They say that it has an expected total return of 15% pa, but a required return of only 10% pa. Assume that there are no dividend payments so the entire 15% total return is all capital return. Assuming that the company's statements are correct, what is the NPV of buying the investment if the 15% return lasts for the next 100 years (t=0 to 100), then reverts to 10% pa after that time? Also, what is the NPV of the investment if the 15% return lasts forever? In both cases, assume that the required return of 10% remains constant. All returns are given as effective annual rates. In general, stock prices tend to rise. What does this mean for futures on equity? (a) Equity futures prices tend to be higher than spot prices. This is called contango. (b) Equity futures prices tend to be equal to spot prices. (c) Equity futures are generally under-priced. (d) Equity futures are generally over-priced. (e) Long equity futures traders tend to make more money than short equity futures traders. Which of the following statements about futures contracts on shares is NOT correct, assuming that markets are efficient? (a) The futures price ##(F_T)## is 'fair'. It's neither over- nor under-priced to the long or short trader. (b) The futures price ##(F_T)## equals the expected underlying asset price at maturity. (c) The futures price ##(F_0)## is initially zero. (d) The value of the future ##(V_0)## is initially zero to both the long and short trader. (e) If the value of the future ##(V_0)## rises for the long trader, it must have fallen for the short trader, and vice versa. The efficient markets hypothesis (EMH) and no-arbitrage pricing theory is most closely related to which of the following concepts? (e) The stand-alone principle, incremental cash flows and sunk costs. A company advertises an investment costing $1,000 which they say is underpriced. They say that it has an expected total return of 15% pa, but a required return of only 10% pa. Of the 15% pa total expected return, the dividend yield is expected to always be 7% pa and rest is the capital yield. Assuming that the company's statements are correct, what is the NPV of buying the investment if the 15% total return lasts for the next 100 years (t=0 to 100), then reverts to 10% after that time? Also, what is the NPV of the investment if the 15% return lasts forever? In both cases, assume that the required return of 10% remains constant, the dividends can only be re-invested at 10% pa and all returns are given as effective annual rates. A company advertises an investment costing $1,000 which they say is under priced. They say that it has an expected total return of 15% pa, but a required return of only 10% pa. Of the 15% pa total expected return, the dividend yield is expected to be 4% pa and the capital yield 11% pa. Assume that the company's statements are correct. What is the NPV of buying the investment if the 15% total return lasts for the next 100 years (t=0 to 100), then reverts to 10% after that time? Also, what is the NPV of the investment if the 15% return lasts forever? You work in Asia and just woke up. It looked like a nice day but then you read the news and found out that last night the American share market fell by 10% while you were asleep due to surprisingly poor macro-economic world news. You own a portfolio of liquid stocks listed in Asia with a beta of 1.6. When the Asian equity markets open, what do you expect to happen to your share portfolio? Assume that the capital asset pricing model (CAPM) is correct and that the market portfolio contains all shares in the world, of which American shares are a big part. Your portfolio beta is measured against this world market portfolio. (b) Instantaneously fall by 10%. (c) Slowly fall by 10% over the day. (d) Instantaneously fall by 16%. (e) Slowly fall by 16% over the day. The famous investor Warren Buffet is one of few portfolio managers who appears to have consistently beaten the market. 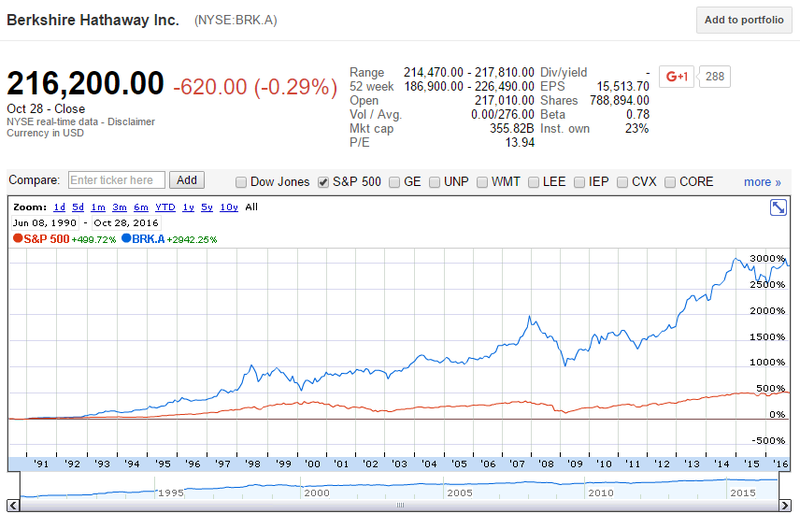 His company Berkshire Hathaway (BRK) appears to have outperformed the US S&P500 market index, shown in the graph below. Read the below statements about Warren Buffet and the implications for the Efficient Markets Hypothesis (EMH) theory of Eugene Fama. Assume that the first sentence is true. Analyse the second sentence and select the answer option which is NOT correct. In other words, find the false statement in the second sentence. (a) Buffet is clever and by reading the news and financial reports he is able to buy under-priced stocks and sell over-priced stocks. This provides evidence for rejecting the semi-strong and strong form EMH. (b) Buffet was lucky, his strategy happened to be the right one, not due to its merits, just by chance. This provides no evidence for or against the weak, semi-strong or strong form EMH. (c) Buffet’s investment strategy exposes investors to higher undiversifiable risk than the market and therefore deserves a higher return. This provides no evidence for or against the weak, semi-strong or strong form EMH. (d) Buffet is an insider trader and is able to make money from his private information. This provides evidence for rejecting the semi-strong and strong form EMH. (Note: Warren Buffet is not an insider trader, he is an honest philanthropist, but assume the contrary in this answer option). (e) Buffet may not have beaten the market because the graphs ignore dividends - the S&P500 is the price index rather than the accumulation index and BRK pays no dividends, so even though BRK has a higher capital return than the S&P500, the total returns could be equal. This provides no evidence for or against the weak, semi-strong or strong form EMH.